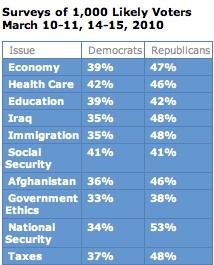 According to Rasmussen Reports, likely voters continue to trust Republicans over Democrats on all the major issues. I suggest that it's the recent conservative, Tea Party philosophy of less spending / lower taxes which has generated popular sympathy for the GOP - and that they should follow the public's lead if they wish to retain their good graces. "Who do you trust more on the economy, the tax-and-spend Democrats or the responsible, grown-up Republicans who know that we all must tighten our belts from time to time?" "Who will protect America from the dirty Mexicans spilling over our border like rats and the Mozlem threat to our Homeland - Democrats like Keith Ellison (Mozlem - MN) and Barack Obama (Kenya?) or Republicans like John Boehner (Christian - OH) and Ronald Reagan (Christian - Heaven)?" 47% have an unfavorable view of the Tea Party. 32% have a favorable view of it. 48% have an unfavorable view of the Democratic Party. 46% have a favorable view of it. 48% have an unfavorable view of the GOP. 44% have a favorable view of it.